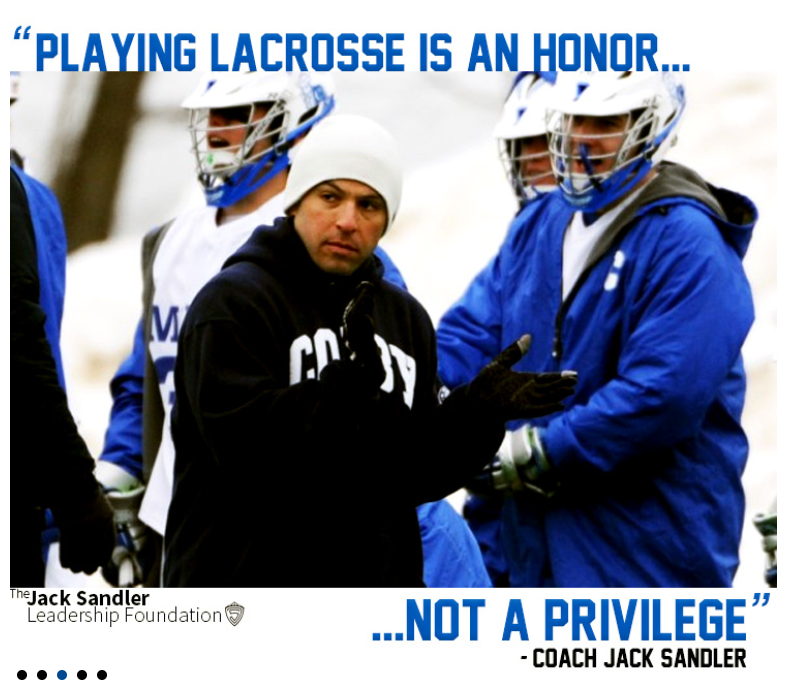 ​Jack Sandler was dedicated to growing the sport of lacrosse his entire life. He humbly focused on being a well-rounded player and person, recognizing his strengths and seeking out opportunities to let them grow and shine. He sought out mentors and grew to be their peers, friends, and competition. Best of all, Jack was a leader. In his time as a coach, he recruited lacrosse players from all walks of life. Inner city athletes, bench warmers, star players, and other coaches found their place with Jack. If a young athlete had lost the love of the game, they'd find it under Jack's tutelage. If they struggled to reach their potential, Jack was there to motivate them. Jack was in his third season leading the Colby Mules after spending eight seasons as head coach at Skidmore College. He led Colby to the NESCAC playoffs in each of his first two years as coach. He coached three USILA Honorable Mention All-Americans and the NESCAC Rookie of the Year in 2014. In that same year, Jack's first season at Colby, the Mules won the CBB title. Jack, who as a player finished as Bates College's second all-time leading scorer and was 1999 NESCAC Rookie of the Year, became an assistant coach at Bates immediately after graduating in 2002. He spent two seasons coaching under his former coach, Peter Lasagna. "It was clear he loved the game of lacrosse and coaching, but his real passion was teaching and helping students develop their full potential physically, intellectually, and personally." A Long Island native from Hicksville, N.Y., Jack attended Friends Academy in Nassau County where he was a three-sport athlete in lacrosse, football and wrestling. At Skidmore, Jack was the Liberty League Coach of the Year in 2007 and 2011. He led the Thoroughbreds to appearances in the conference title game in 2007 and 2010. The 2011 Skidmore team was ranked as high as 11th in the USILA poll, the top ranking in program history. Jack was a member of the USILA executive board as an NCAA Division III representative and was to continue on the board until 2016. He also was part of the USILA All-America Selection Committee from 2011 to 2013 and has served on the NCAA Regional Advisory Committee from 2007 to 2010. Jack was also involved in the Saratoga Springs, N.Y. community, where Skidmore is located, formerly serving as a co-chair of the executive board for the Saratoga Partnership for Prevention, an organization dedicated to decreasing youth substance abuse. Jack's friend and teammate at Bates, Morgan McDuffee, was tragically killed during their senior year near the college in 2002. It was important to Jack to keep Morgan's legacy alive, holding annual memorial games in his honor and regularly contributing to Morgan's Fund; which supports groups promoting anti-violence programming and mediation, including Metro Lacrosse, a Boston nonprofit whose mission is youth development and education through lacrosse competition.